Limited time get a discounted price on shipment of your unique handcrafted screen door. Call or email us for details. If you have a French Interior set that is new, than a purchase of some French solid Cedar wood Screen Doors might just be the most important addition! If you have old French Interior doors than you probably know exactly what were talking about. French Interior doors are notorious for moving and losing their seal over the years but if you protect them with a set of Cedar screen doors you may extend their life for many years to come and help stop that draft that usually happens with them. Let the solid Cedar screen doors take the brunt and do not worry they can take it! The Pacific two design solid wood Screen Doors keeps with that craftsman style tradition with mirroring each door together and letting the book matching technique that we do at mtn view woodworks work it’s artistic magic! Any of our doors can be used as a French set and all you need to do is let us know what side the astrigal is on or what is the active door. 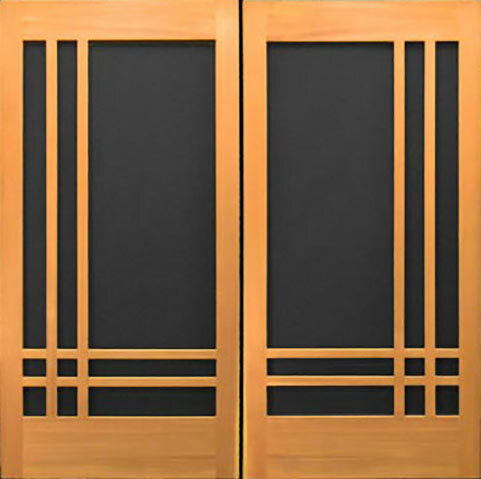 Also remember that these Pacicific two design Screen Doors can also be sold seperatly as a single door as well !